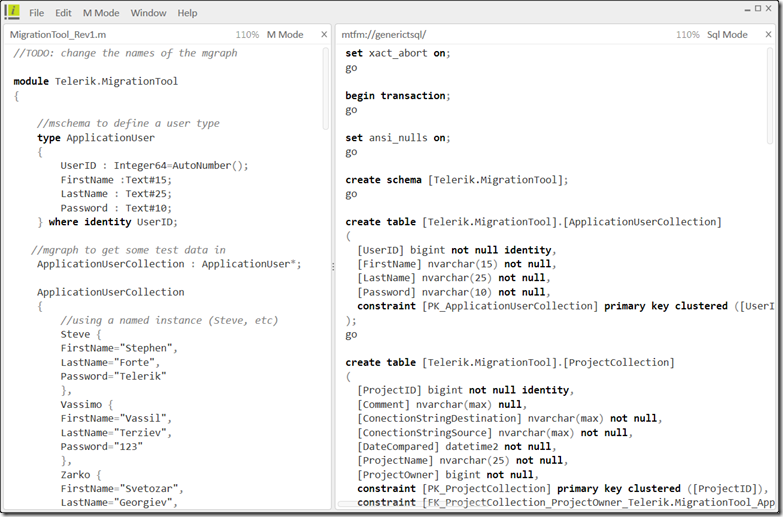 In Part I of this series we looked at the tool Telerik is building and how to model an entity in MSchema and MGraph. Part II dug deeper into the modeling process and we saw the value of MGraph and data visualization to help your model along. We did a little refactoring and are now more or less happy with the model for these domain entities. After modeling the application in M, I realize the power of a textual modeling language. Boxes and lines in UML does not excite me, but a textual modeling language makes complete sense. So far we have ignored the fact that these entities will live in a database. You can push your M into the repository or you can push it to plain old TSQL. Let’s do that today. Let’s take a look at the TSQL produced. Ug! ApplicationUserCollection is a horrible name for a table. I incorrectly assumed that the type name would be what we have as a table name. (I guess I should have actually done the M labs at the last SDR instead of goofing off with Michelle Bustamante.) Well this is new technology, so live and learn. :) I have to refactor all my types and instances. I guess I have learned pretty quickly that “collection” is not a good name. I ran the entire TSQL and then the next step is to load it into the database. As you can see in the image below, all my tables were created successfully. 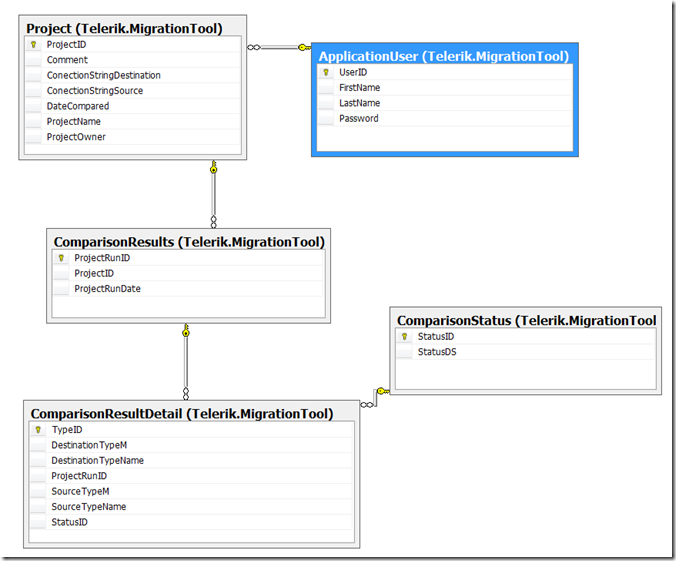 As you can see MGraph creates a SQL Server schema [Telerik.MigrationTool] out of the module name in our M file. This is a pretty cool feature (SQL 2005/08 schemas are not used enough, there is too much DBO floating around out there.) 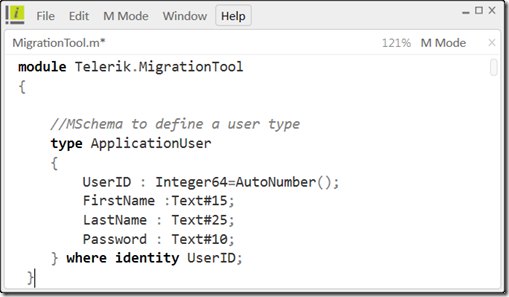 I guess I can use an easier to work with schema in the future like migrationtool instead of telerik.migrationtool. I am pretty satisfied with the results of my model. I think the next step is to hand off the user stories and M code to the developers and get started. I will post their reactions, they know nothing about Oslo besides what they read in this blog. :) I will also post my progress and thinking on the repository. I think that now we are going to be working with a team (and a team in another country than me), we can get some benefits by using the repository. In Part I of this series, I talked about Oslo in general and about the tool Telerik is building for Oslo. Where we stand today is that I modeled a simple entity (User) and I still have to model some domain entities in MSchema and MGraph. The application I am modeling will allow a user to create a “project” that has the connection strings to the two Oslo repositories they are comparing. Then they will have to in a very Red Gate SQL Compare like fashion compare the entities in the repository and report back a status, including showing the offending M code that is causing a problem side by side with the good M code. Let’s get started modeling my top level domain with M.
As I am thinking now I need a “project” entity. Here is my first stab at a project entity. You can see that I am making a reference to the ApplicationUser type in my “ProjectOwner” field. 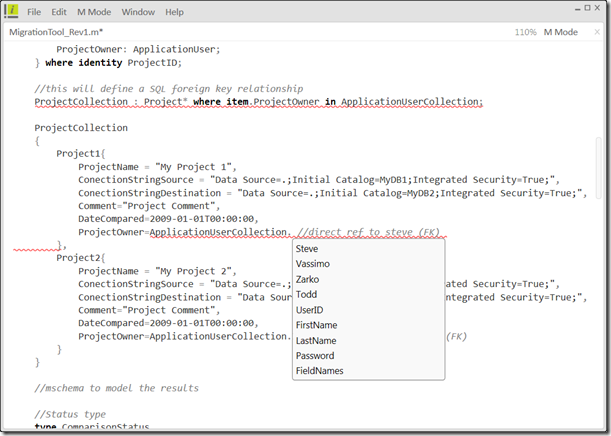 Down the line we will have this as a foreign key relationship in SQL Server, but we don’t have to worry about that now, for now we just realize that a ProjectOwner will refer back to the ApplicationUser type we build in Part I. Next I need to model the results with a results type. SourceTypeM: Text? ; //is it possible to generate this on the fly? is there value in storing it? DestinationTypeM: Text? ; //is it possible to generate this on the fly? is there value in storing it? Notice how we have some relationships stored back to ProjectCollection. Now we need to add some data via MGraph. Remember it was above in MGraph where I had this breakthrough. So today I modeled some domain entities and learned that when you play around with adding data via MGraph, you will learn and evolve your model much better. I suspect that showing this to the users will help, that is one of the goals of Quadrant. So with this model, I still have not pushed it into the repository yet, I am saving the data on disk in M files. I think that pushing to the repository may be important to do soon (time will tell if this is a best practice or not, remember I am learning!) It is now time to start playing with the MGraph and MSchema transformations to TSQL, that will be the subject of Part III. The M language is very exciting. M is actually a little like XML and XSD. Meaning that you never do anything in XML, you create an XML grammar (XSD) to give your XML some meaning. M ships with two tools to give your M some meaning: MGraph and MGrammar. With Oslo you will create an M grammar using MGrammar; MGrammar a contextual DSL creation language. MGrammar will convert your users or applications’ input (the users of your DSL) into MGraph. MGraph is a JSON-style M syntax that will allow you to put data into an instance of your M type. I’ll go more into MGrammar later on, but for now, let’s use one DSL that ships out of the box for Oslo: MSchema. MSchema is a DSL for TSQL DDL or data definition language. 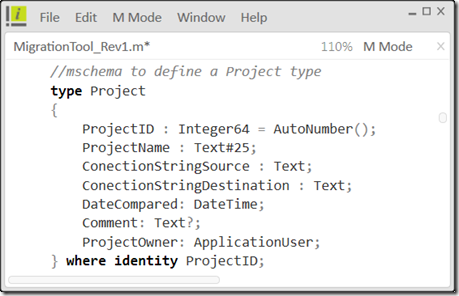 If you learn MSchema, you don’t have to deal with TSQL “CREATE TABLE” ever again. (For some of us this is a good thing.) MSchema is just one of many M grammars that will ship with Oslo, others will include MService, a DSL for working with WCF in C# and VB.NET. I will not give all the details of the application here, not because it is super-secret, but because they are still evolving. Also I want to focus more on the process I took and the M code itself. In a nutshell, we are building an Oslo repository comparison tool with an M visualization engine as well as a data migration piece. Sorry to be vague, but only the first sprint or two are clear in my head, future sprints and versions will include a Visual Studio 2008/2010 plug in, a repository migration wizard, and a contextual DSL using MGrammar. We are building the repository comparison piece in the first few sprints and I will discuss it here. As I pointed out before, I was approaching this design process the wrong way. First I was writing up some initial user stories and then started to model the domain around those stories using various tools (mostly on paper) so they can be translated into requirements for developers on their first sprint. I was building a tool for Oslo, but I was not using Oslo. So I started over and did this the Oslo way. I still started with a user story, but to accompany the user story, I started to model the domain using the M language. I am not sure if this is the right way to be completely honest, but it felt like the right thing to do since imho, it will be easier for the developer to understand these user stories and then estimate them and move them to the product backlog. It feels like a modified version of Scrum and DDD, but I am far from a purist. While you are suppose to do the design as part of the sprint, I don’t think that modeling a few domain entities is a true design, I expect the team on the first sprint to completely refractor this (via M) as more issues and requirements come to light. Of course I am not the typical user to write a user story. I don’t expect users to know M, so maybe in the real world where the user doesn't know M, a developer will do the M code to accompany the user story, or do it as part of the sprint. As I play more with Oslo, this process will become more clear to me. I suspect that there is not going to be a right answer, it will be a matter of preference. Anyway, the first thing that we need is an entity to deal with the users of the application. So I fired up Intellipad (or iPad) and I used MSchema to define a type called “ApplicationUser.” The type is defined below. What I like about Oslo is that by defining the type here, I am giving the developers my intent. While they will most definitely rename, refactor, and reorganize this before it goes into production, they know the intent, the application will have a user and that user can log in with a password. I think this is more natural for a developer to work with (since it is code!) than boxes and lines or a formal written spec, or at least compliments those traditional artifacts nicely. Now I need an instance of this type. I only can truly get a grip on my type once I put some data into it. This is where other modeling platforms fall down for me. Once I play a little bit with the data, I realize my model is wrong, and I go back and add to it. To add some data, I need to use MGraph. To me, this seems like a collection of ApplicationUser types, so I named it the most logical thing that came to my mind: ApplicationUserCollection. Not sure if this is the best name for this collection or not, but hey, I am learning and I know this will be refactored by me a few times before it is refactored by the developers many times. So I will leave it this way and see how it evolves. Think of ApplicationUser as the class and ApplicationUserCollection as the implementation or the instantiated object. Not an exact analogy, but it should give you a feel. I can also bound another instance like so: SuperUsers: ApplicationUser*; however, we only need one instance. When this is all compiled by the M parser, this will be transformed into TSQL INSERT INTO statements into my table, the table that was defined in my ApplicationUser type. We don’t have to worry at all about TSQL and SQL Server now since all we are doing is modeling the application in MSchema and MGraph. We won’t bother converting this to TSQL now, since I guarantee it (the M code) will change soon. Stay tuned, the next part will show a domain entity and some refactoring. As I make progress each day I will continue to post. NYC Code Camp Code Downloads…. Many of you have been asking, so here it is. 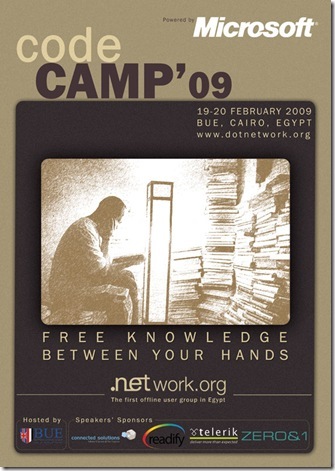 You can download the sessions materials here.